LIMA, Peru — A Peruvian forensic expert said Thursday that a British Catholic missionary and environmental activist died before his body was burned at a youth hostel he ran in the Amazon region. Loreto region chief forensic doctor Francisco Moreno told The Associated Press that that no carbon dioxide was found in Paul McAuley's blood, ruling out burning as the cause of death. 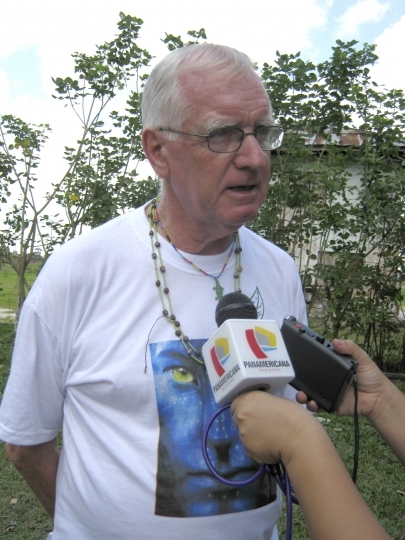 The 71-year-old missionary was found dead on Tuesday at the shelter he founded for indigenous schoolchildren in a poor neighborhood in the city of Iquitos in the Loreto district near the border with Brazil and Colombia. Prosecutors have not yet said if McAuley was murdered or what the motive might have been, though Moreno said the body was burned "in suspicious circumstances." Investigators have been collecting evidence and interviewing the students. Moreno said Thursday that additional tests are being carried out. The La Salle Christian Brothers had said in a statement Tuesday that the lay activist had been burned to death. The Portsmouth-born McAuley, an Oxford-educated philosopher and mathematician, had long worked to embolden Peru's historically discriminated-against tribes in the battle against powerful oil and mining interests. In 2004, McAuley founded the Loreto Environmental Network, a group that works on behalf of indigenous groups. He and environmentalists opposed then-President Alan Garcia's moves to open the Amazon to unprecedented mining and oil exploration and drilling. They also complained that Garcia's government has done little to impede rampant logging, which they say threatens the existence of indigenous groups. In 2010, the government tried unsuccessful to strip him of his residency for allegedly inciting unrest. McAuley had denounced oil spills in the forests and rivers of the Amazon and the discovery of heavy metals in the blood of local indigenous people. He was buried on Wednesday at a local cemetery after a ceremony attended by environmentalists and members of the La Salle order.